Abbeyfield is not a “care home”, but a facility which gives you the ability to continue to lead your life your way. The Cooks will provide you with not only companionship but also with excellent, well-planned meals. 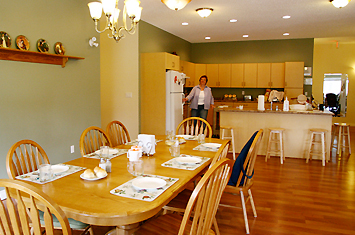 The home cooked meals are prepared in the large kitchen and served in the open and friendly dining area. There is no extra cost for meals as they are included with your accommodation fee. The kitchen is also available to use between mealtimes if you choose to do so. Abbeyfield is a beautiful, spacious home equipped with 12 private rooms. Each of these bright and cheerful rooms feature in-floor heating and a half bath to provide for your comfort and privacy. 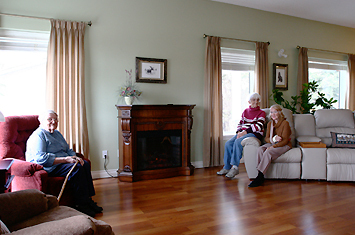 There is a large, open great room suitable for lounging, on-site activities, or for entertaining guests. If you prefer, you may choose the comfort and solitude of the library (which is stocked frequently) for your reading or visiting pleasure. We strive to provide a family atmosphere in your new home and your visitors are always welcome. Abbeyfield is located in a peaceful residential area conveniently close to bus stops and to Fort St. John's extensive walking trails. The basement is fully equipped with lockers and boasts a large open space which may be used for a variety of indoor activities. own vehicle as Abbeyfield has parking spots available for residents and visitors alike. Independent supportive living at it's best. 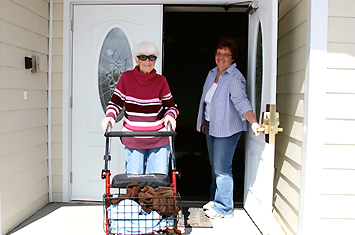 Two nutritious home cooked meals provided daily. Opportunity to prepare your own breakfast when and how you like it (food provided). Emergency Response System links every room to the Overnight Attendant. Free access to the kitchen for snacks anytime. Two rooms specially constructed to accommodate wheel chairs. All rooms are on ground level. Complimentary washer and dryer provided for personal use. BC Government S.A.F.E.R. assistance available. Guest room available for over night guests. All guests are welcome for meals with advance notice to Cooks. Library has a large selection of books. Small private sitting room available for entertaining family & friends or special occasions. Exercise program in place with a qualified physio instructor. Physio equipment for personal use. Handi-dart bus available to any qualifying resident. Every room provided with tv and phone outlets. Lovely ground level patio to enjoy. This cost effective living is more affordable than you may think! 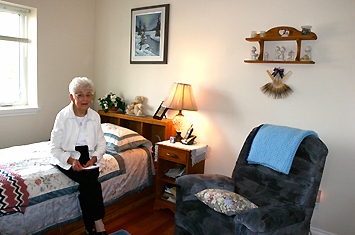 Call Abbeyfield Houses of Fort St. John 2006 today and set up an appointment for your personal tour!